Which Aisle are you walking down? You know how much I LOVE guiding you toward a great vendor or a super sale. Well, I’ve mentioned it before but the time has come. 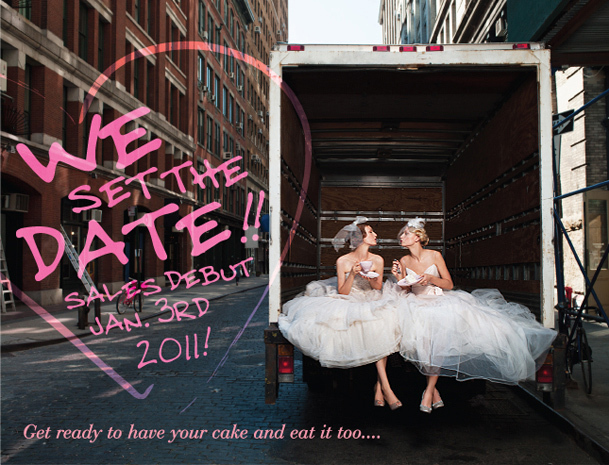 The Aisle is officially open for business on Jan 3, 2011 at 11:00AM. The concept is great – find the designer gown (shoes & accessories) of your dreams all under one place! The best part they are up to 50% off . If you haven’t signed up for their newsletter, do so. Designer Bride Group is not just a new label…it’s a concept for the wedding industry. Created in 2010 its focus is the “new” bride, meaning a more mature, sophisticated and independent woman. What makes this concept so unique; the designers who created this already have an extremely successful ready-to-wear lines. Lilly Pulitzer, Carmen Marc Valvo, David Meister and Angel Sanchez. The designer’s collection can be found at Neiman Marcus, Kleinfeld Manhattan and Mon Amie bridal Salon. These mid-level price points for the bride that is brand savvy and price-conscious. With gowns that range from $1,200-$4,000 which is an absolute steal considering their individual brands. Sales will begin Dec. 2010. This season Angel Sánchez gave me a gift. What was it? The gift of a photographers’ angel. I caught a glimpse of the models backstage as well as an understandably nervous Angel peeking out from behind the partition looking into the crowd. Of course you don’t expect a man who has created countless collections would still get nervous but I think it simply shows his humility and charm. Angel Sánchez is a designer who is passionate about his designs, a superstar in the industry yet extremely humble and modest. So who is the Angel Sánchez bride? She is confident in her own skin. She loves being a woman and her femininity shows in everything she wears. Most importantly, she is a woman who wears the dress, not the other way around. Modified ball gowns and trumpet skirts with detailed accents ruled the collection. The banded skirt and a beautiful keyhole neckline is my personal favorite. Angel spoke at an event just two nights prior and wondered aloud what the reaction of this collection would be. I can say, at least for me…Perfection.